In chair teeth whitening explained by Ballarat Dental Care dentists in Ballarat: In chair teeth whitening procedure to whiten the teeth done by dentists can get teeth brighter faster. The bleaching solution is usually stronger than at home kits. Also, heat and light, or a combination of the two may be used to speed and intensify the whitening process. Dentist will perform an oral exam and consider your complete medical history, which can be helpful in determining if bleaching is an appropriate treatment based on the type and extent of stains. If appropriate, to lighten those stains the dentists will start the in chair teeth whitening procedure. Dentist has to isolate the teeth’s that needs to be whitened using cotton rolls, gauze and retractors. Dentists will then apply special bleach to the teeth and it will be left on for 15 minutes and then the teeth are washed off and it is repeated up to 3 to 4 times by the dentist. Dentist will use a special desensitizing gel to help with any sensitivity that can occur. Dentists would have taken moulds from the initial consultation for teeth whitening, those moulds would be used by the dentists to fabricate clear custom bleach trays and the dentist will try them on you and make sure that the fit is accurate and comfortable. Depending on the teeth whitening system used, the dentist will explain the teeth whitening procedure to be followed at home. The trays will need to be worn as recommended by the dentist until the desired effect is achieved. 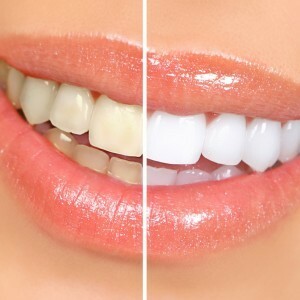 Teeth whitening effect will vary from individual to individual. If any sensitivity is experienced, GC tooth mousse can be placed in the trays and can be worn. A recall appointment will be made to check on the results and an examination will be carried out by the dentists.